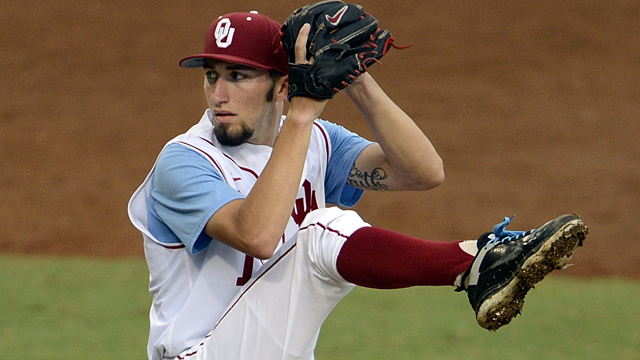 In front of a crowd of 1,288 -- roughly the same size as he was used to in college -- Dillon Overton returned to the decorated Oklahoma pitcher the A's were first interested in. Fourteen months after being drafted in the second round, Oakland's fifth-ranked prospect tossed three perfect innings as Class A Short Season Vermont shut out Aberdeen, 6-0, on Tuesday at Centennial Field. "It's good to finally be able to throw in front of a lot of fans again," the 22-year-old said. "Changeup was working extremely well and good movement on downward plain. … Coming off Tommy John [surgery], you don't want to try to throw as hard as you can. So every time I go out there, I try to keep myself calm and under wraps." Overton, who struck out three IronBirds, said he felt in control for the duration of his second start with the Lake Monsters. A few days after the 6-foot-2 hurler signed with the A's in 2013, it was announced he needed Tommy John surgery. But Overton's rehab went smoothly, and within a year, he was back on the diamond. "After surgery, I never really had pain. I had my movement back in my arm very quickly," the southpaw said. "My trainers said I was ahead of the schedule and I was excited to get back on the field." The Oklahoma native went 0-2 with a 1.64 ERA while striking out 31 over seven rehab starts with the Rookie-level Arizona League Athletics. "Waiting after that first year, it was tough, especially after not getting to pick up the ball for four months," he said. "In this game, you're going to have hard times and I am glad I got it early in my career rather than three years from now." In his first start for Vermont on Aug. 6, Overton allowed a run on three hits while striking out three over three innings. While the lefty said his location is where it used to be, he is still working to return his release point with his changeup and curveball to form. "I'm extremely happy, coming along better than I would've thought," he said. "I'm getting closer and closer every time I go out … but not nearly as close as where you want to be." Overton's former Big 12 rival Brett Graves (3-1) followed with 2 2/3 perfect frames before allowing a single to Tad Gold. The third-round pick in this year's Draft out of Missouri struck out two to pick up his third victory. "He's got great stuff. I don't remember a whole lot about facing him in college, but he has tremendous life on his pitches," the starter said of Graves. "He's a great guy to watch and I try to learn from him every time he goes out there." Left fielder Max Kuhn went 2-for-3 with a double and three RBIs for the Lake Monsters.